When we make an effort to visit critters in their environment, we naturally expect them to show up. We’ve been pretty lucky in that regard, with bison, crocodiles, deer and dolphin all bending to our will. But maybe we’ve set our expectations too low. Maybe it’s not enough that they simply show up and allow us to take pictures. From now on, we’re demanding that they perform tricks, too. 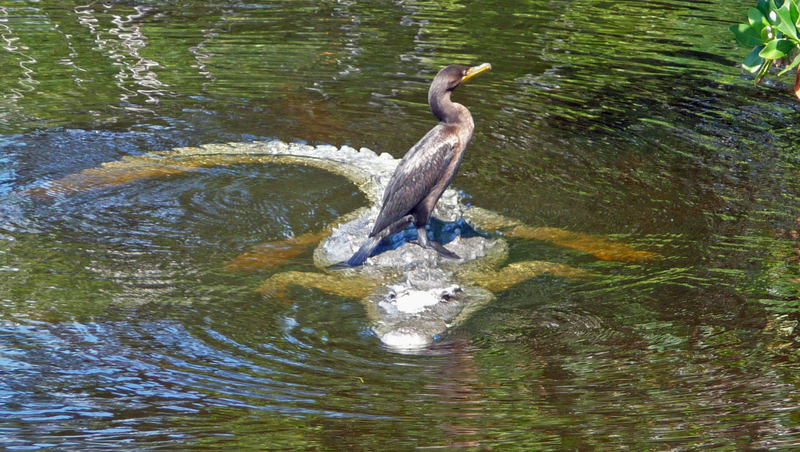 So here we have a Double-crested Cormorant riding on the back of a crocodile. A National Parks Ranger told us she’d never seen anything like this before in her 15 years at the park, and doesn’t expect to see it again. Which isn’t surprising because it isn’t every day you see prey riding its predator like a birthday party pony. That’s amazing!! Send it to Nat Geo! Yeah, we thought it was pretty amazing . . . especially when someone who’s spent most of the last 15 years in the park says she never saw anything like it. As far as Nat Geo, unfortunately the quality of both the image and the video are not up to their standards. Did you click on the video? I think it’s pretty funny. Yes, I did watch the video. It’s as if the alligator is the bird’s personal water taxi. If you don’t mind, I’m going to share it om my facebook page! Ah, well. The FB post didn’t work. I shall just have to keep it all to myself!